Do I have to prepare my area prior to sowing my seed? Yes. Preparing the area is really important, both for the short-term and long-term success of your wildflower planting. The more time and effort you spend during the initial preparation stage, getting rid of any grasses and weeds (and their entire root systems), the better results you'll end up getting come bloom-time. By removing the grasses and weeds, you'll be eliminating any competition that your wildflowers may come up against; competition for water, available sunlight and soil nutrients. I can't stress enough how important it is to get yourself some nice bare soil as a starting point, so that your growing wildflowers can access their 'fair share' of resources. This will make a world of difference as your wildflowers enter those crucial early stages of growth and seek to establish themselves. "When growing wildflowers, preparation is critically important to the overall success of your planting. The good news is that after you help them get their start, your wildflowers will require very little effort on your end." Do I have to cover my seeds once I've sown them? No. Ideally, once you've broadcast your seed over the surface of the soil (either by hand or with a seed spreader) you'll want to lightly press them into the soil. This 'compression' can be achieved by walking on a board laid over the seeds (directly in shoes is okay, too), or, if you're planting a larger area, by using a seed roller. "You really don't want to rake the seed in or cover the seed because that could potentially hamper germination and lead to mixed results that don't meet your overall expectation for the planting." View our complete instructions for planting and growing wildflowers here. What happens when the birds and squirrels try to eat my wildflower seeds? Don't worry, your wildflowers are going to be fine! Birds and squirrels and other animals can come in and eat a few seeds; but they can't make enough of a dent for you to worry about it. 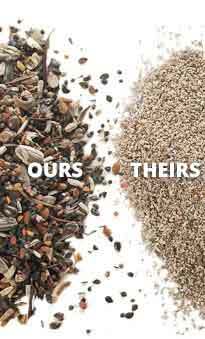 Just to give you a sense, there are roughly a 100,000 seeds in a quarter pound of our seed mixes! That should make it easier to visualize why the success of your meadow and the overall outcome will still be perfectly fine, even if the birds show up. "If you do tend to have a lot of birds come in, you can always put a light coverage of straw on top of the seed to offer a little more protection. In most cases, even if the birds arrive right after the seed is sown, it just won't make much of a difference." How soon after I plant my wildflowers should I expect to see color? Well... under the assumption that you planted a mix that included some annuals (annuals are flowers that bloom in the first year), you can expect to see germination (green sprouts) in about 7 to 14 days. Your first annual color should begin to arrive about 5 to 7 weeks after you've sown your mix. "Under optimal conditions, where the ground temperatures are above 55 degrees and there's available sunlight and moisture, you'll see germination in 7 to 14 days and flowers in about 5 to 7 weeks." Many mixes also include perennial wildflowers, which have a longer life-cycle than annuals and generally bloom for the first time during their second season. While perennials need the first growing season to establish themselves, the upside is that they don't need to be re-planted the following year and are usually actively growing before annuals are able to be seeded.